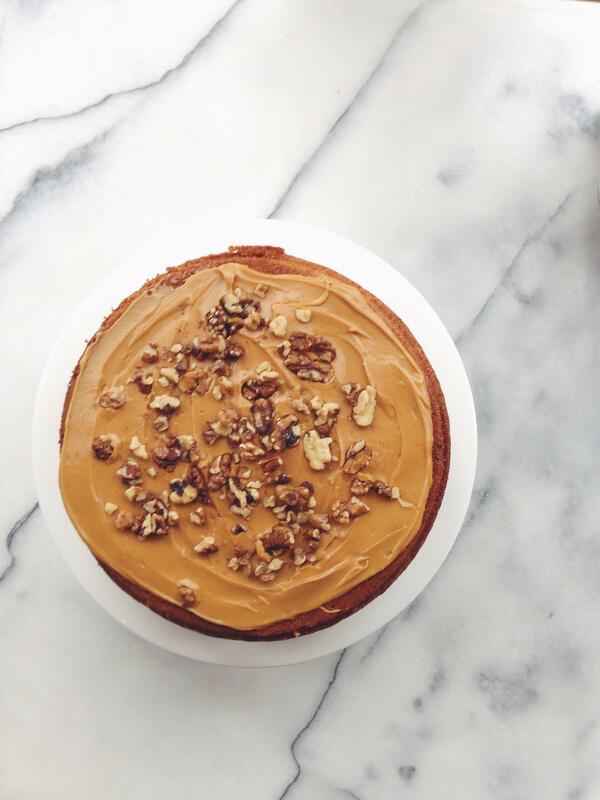 This heavenly coffee and walnut cake recipe is a delicious teatime treat. The method couldn’t be simpler and there is very little equipment required. If you haven’t baked a cake before, this is a great introductory recipe, but always remember two things: don’t open the oven door while the cake is baking, and be gentle when folding in the walnuts, so as to retain as much air as possible in the cake mixture. Pre-heat your oven to 180c/160 fan/gas mark 4. Line and grease a medium-sized cake tin. Sift the flour and bicarbonate of soda into the bowl of a large food processor. Add all of the other ingredients and blend until the mixture is thoroughly combined. Keep and eye on the cake mixture as it is blending and turn the food processor off as soon as it comes together. Gently fold in 100g of the walnuts into the mixture and tip into the lined cake tin. Bake for 1 hour. Once baked, set aside on a cooling rack and allow to cool completely before removing the tin. To make the buttercream, add the softened butter and sugar to a medium bowl and beat together using an electric whisk until light and fluffy. Add the espresso and mix again until combined. Once the cake has cooled completely, remove from the tin and, with a palette knife or silicone spatula, evenly spread the buttercream on top. Scatter over the remaining walnuts. Are we losing our taste for gooseberries?